From: Dr. Steve G. Jones, Ed.D. Are you motivated? The truth is most people aren’t. And it is actually unrealistic to think that you even should be. Human beings are hard-wired to work until there is food on the table and the rent is paid. Once the belly in full and we feel safe, we lay around. But you are here because you want more. The secret to motivation is understanding how fragile it is. It is constantly under siege from negative thoughts, fears and outside influences. If you gain control of your mind, you can be rich, free, healthy and happy. The key to success is to have your subconscious mind work FOR you, not against you. There are two steps to becoming Super-Motivated. First, stop filling your mind with negative thoughts and attitudes. Reduce your stress levels. So if you feel your life is in a rut (definition: a grave with both ends knocked out), stop digging! Second, fill your mind with uplifting, positive thoughts and attitudes. Easily said. Difficult to do. You are used to watching TV, reading the newspapers, listening to your friends complain. You are not used to filling your mind with empowering thoughts and images. Everyone likes to think they are in control of their life. But having practiced hypnotherapy since the 1980s, writing 14 books on Hypnotherapy. and am an active member of the National Guild of Hypnotists, I can tell you that’s not true. And if you don’t believe me, look at the gossip magazines at your local grocery store. They are full on stories of famous people who act like children. Charlie Sheen was the highest paid actor/comedian on TV and blew it completely. They even hire other people to keep them out of trouble and they still sabotage themselves. Why are they so obviously out of control? Your subconscious mind is 95% in control your habits, beliefs, and how you react to the world around you. You have to have it on your side. Hollywood actors, writers, directors, and producers come to me to help them achieve their very best in film and on stage. They understand that it takes work to become world-class at their craft and it takes work to keep their subconscious mind on their side. Everyday we are bombarded with stressful, negative messages which sap our motivation. The problem is we are so used to it, we don’t even realize it is happening. The only way out is to be proactive, reduce that stress and replace the negative with positive. Otherwise, you lose the battle for your mind. “Working with Steve was a fabulous experience. He helped me overcome my fears and move on more successfully in life and in my career. Face it, your mind is under siege. Since you were an innocent child, you were taught powerful beliefs and attitudes which limited your success and blocked any motivation to achieve your goals. “Dr. 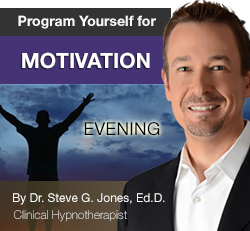 Steve G. Jones has given me several sessions of hypnosis which have been extremely beneficial to me because I was unable to get to the root of the problem through any other method. Ever hear that you need a college education to succeed in life? That’s a limiting belief. And it is not true. Now do I recommend dropping out of college? No. I have a Master’s degree and put a high value on my education. But I will take a highly motivated college dropout over an un-motivated college grad every day of the week. But how do you throw out the negative thoughts, beliefs and feelings and replace them with empowering ones that spur your motivation to new heights? Hypnosis opens the door to unlimited success by helping you relax, focus and become more motivated to go after the opportunities that bring about real success however you define it. Hypnosis works by cultivating information and traits already present in you so that you can achieve your full potential. It is a method of clearing the clutter from thoughts and actions that can be crippling to your efforts to move forward in your life. Is that conducive to being motivated? These Affirmations have been designed by me to get your day off on the right foot. when your day begins powerfully, you have a ton of great energy propelling you forward towards achieving your goals. This morning session is extremely effective. Listen every morning for 21 days and you will be astounded at the effortless difference it makes in your life and that of your family. Plus, you don’t feed your body once a day, either. You eat in the morning, then lunch, then dinner. 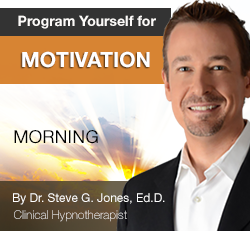 This program motivates your subconscious mind and you have to reinforce it regularly throughout the day. Whether you’re a seasoned meditator, or someone that has never tried to meditate before, this program will give you the push you need to take your life to another level! All the negative messages you were exposed to during the day are replaced by motivating messages. And it is seriously amazing, how quickly your subconscious can turn it around. 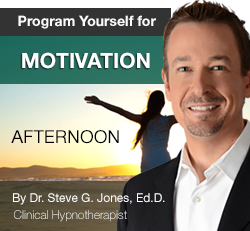 With over 2 hours worth of audio hypnotic sessions, Program Yourself For Motivation is designed to help you finally achieve the success that you have dreamed of. By the end of twenty-one days, your mind will be aligned with your desires, and you’ll have every tool you need to achieve success in all key areas of life – wealth, health, loving relationships and happiness! Simply put, Program Yourself For Motivation will transform your life. You’ll be saving $89.88 when you take action today. When you purchase the Program Yourself For Motivation program you will have a full 60 days to experience the program and ensure your satisfaction. But you are fully covered by my iron clad, no quibbles satisfaction guaranteed policy, which means if you are not totally delighted with this program you will get a prompt and courteous refund. Grab Then or Miss Out! Listen, I wouldn’t offer this guarantee or this program, if I didn’t know it will help turbo-charge your efforts to gain the success you want in all areas of your life. I know what it feels like to constantly be disappointed in yourself, when you know you are capable of so much more. I want you be able to put that in the past and be one of my success stories. You don’t have to — but you have the chance to finally build that life of your dreams, from the comfort of your own home. Living your dream life is a very real possibility once you start rewiring yourself with my powerful motivation program. P.S. Remember, you can download the Program Yourself For Motivation sessions today and ALL the risk is on me! Try it for 60 days and see for yourself just how powerful these sessions really are. 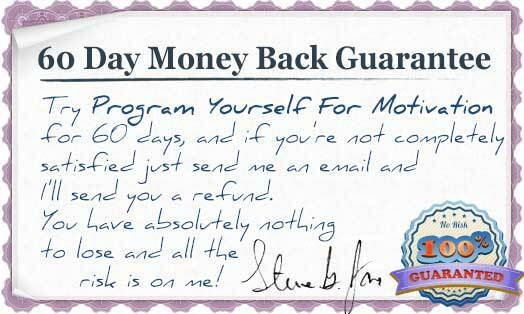 If for any reason you are not satisfied, simple email me for a prompt and courteous refund. P.P.S. There is a very real chance if you decide to think about this and come back later… that the price of Program Yourself For Motivation could be at its regular $119.85 price. Don’t take that chance. Grab your program today, completely risk free. I understand that by taking action and reserving my copy of Program Yourself For Motivation, I’ll get instant access to morning, afternoon and evening sessions to motivate and inspire me to create real wealth in my life! I am acting FAST — So please let me take advantage of this amazing offer for just $29.97 before you come to your senses and raise your price! I understand that I have a full 60 day money-back guarantee to examine my Program Yourself For Motivation sessions. It is on that basis that I am clicking the secure order now button below and entering my credit card details to claim my copy this instant!